Hello, this is my first post on the reaper forums. 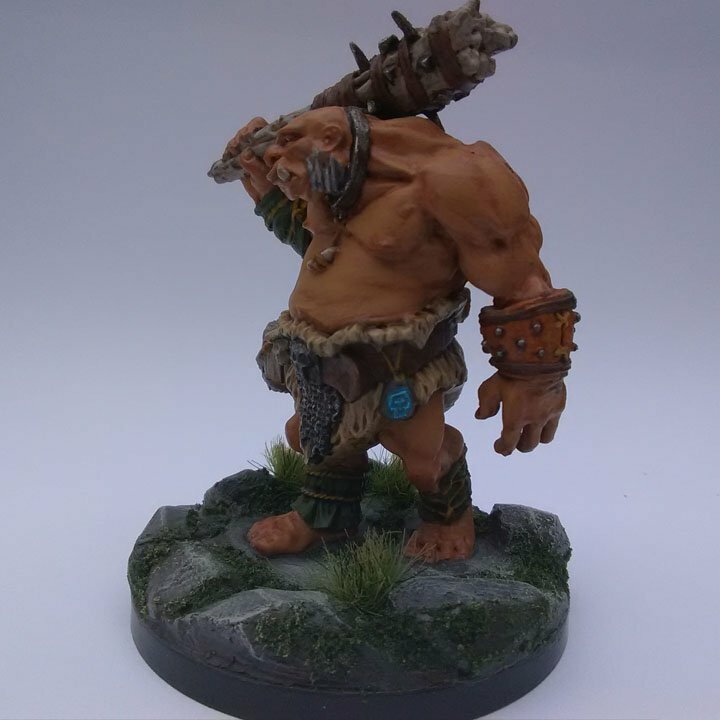 I wanted to share my most recently painted miniature, the Ogre Guard sculpted by Bobby Jackson. The base is made out of a 74036: 2" Round Base, some apoxie sculpt for the rocks, green flocking and some army painter grass tufts. I picked this figure because while he is intimidating, he hasn't started attacking yet. This monster fits the look of both wild beast or gentle giant. Welcome! Nice job on this guy! Also, welcome to the forums! I loom forward to seeing more of your painting. Very nice, and a great base, too! 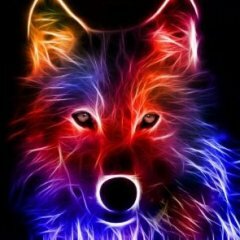 Nice work and welcome to the forum. I should mention how helpful the inspiration gallery on the main site was for this paint job, hopefully I can add some of my own pictures to it too. 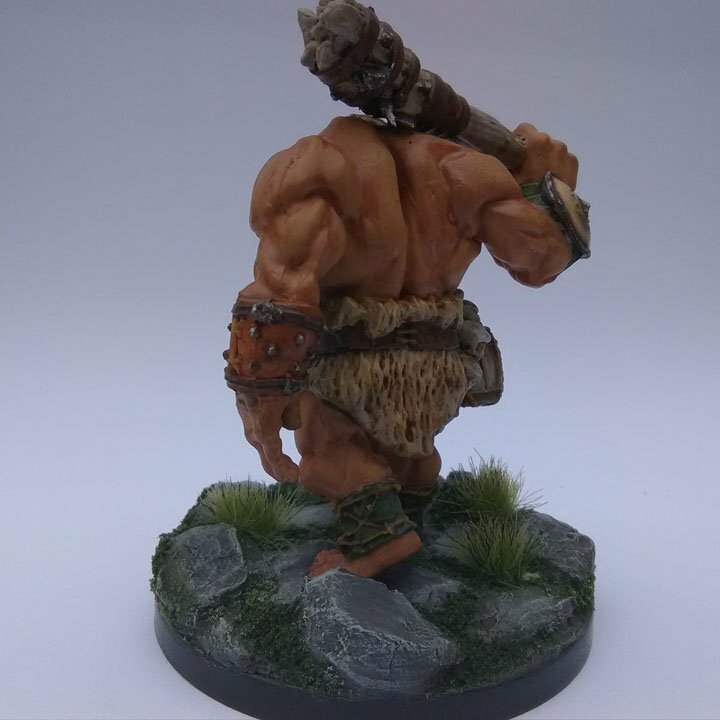 The ogres are such great minis and you did a very nice job painting and basing him! 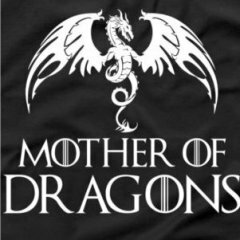 Welcome to the forums! Welcome - nice job on the ogre, and I agree he looks like he's in repose, maybe he'll attack, maybe he'll just talk - your painting really reflects that with the natural tones - really like the base with the tocks! Nice job. 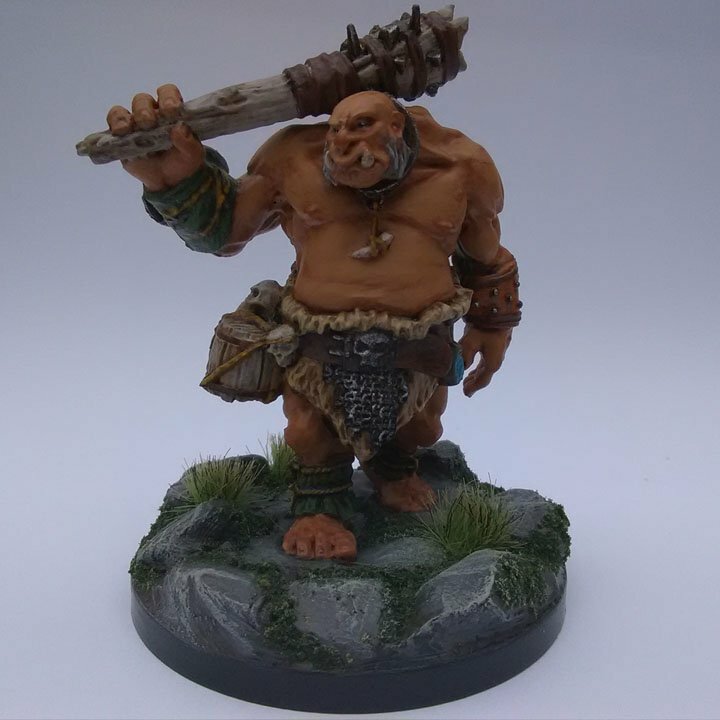 I really like this ogre mini, every time i see him with his mutton chops i want to try and find a little top hat for him because an ogre would totally think that a top hat = civilized. also he could be a bouncer rather then a guard. Your lines of color are so clean. That takes a steady hand. Barnabas is representing a sea dwarf ship captain played by one of my DND players. His trident was forged by Poseidon from the deepest coral; it is harder than adamantine armor. I got two Efreetis in my recent Reaper order. Out of the two one had far more gap lines than the other, so I opened the one that would take less effort to work on first since it's been awhile since I have properly tinkered with a mini. First thing's first, gap filling! This model had quite a lot of mold lines too, I dealt with most of them with an xacto knife and a file. The Bones Black material is brittle enough to handle a file if you're careful unlike the white Bones counterpart. While priming I noticed that part of one of her horns was missing, must have snapped off during shipping or during my work on her. Touched it back up with some more green stuff, just waiting for it to cure before I prime over it. In the mean time, there is nothing stopping me from popping into Procreate to play around with a colour scheme. I wanted to try something a but different than other painting examples I had seen. Still incorporating the red and gold, just in different ways.